Vermont’s Sweetest Season is here! We have a pretty sweet special here at Sterling Ridge Log Cabins this month! Would you like to get back to nature but still have all of the amenities you’ve come to expect? Reserve one of our cozy log cabin rentals in Vermont with a fireplace or wood stove (and, yes, WIFI!) for three nights between March 2nd and March 19th, and you’ll get the third night FREE! You can sweeten that deal even more by adding our “Limited Edition” Maple Madness Basket! 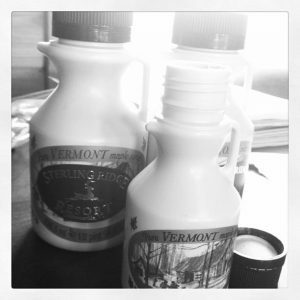 It is filled with everything you need to satisfy your sweet tooth, featuring an assortment of Vermont maple treats including: maple candies, maple chocolates, maple pretzels, maple apple chutney and our own Sterling Ridge maple syrup. Be sure to mention that you are getting our free night special when you reserve your beautiful cabin in the woods, and ask about the Maple Madness Basket, or other special baskets that make your stay at Sterling Ridge Cabins that much more memorable. Come stay with us this sugaring season, and enjoy all that our area and resort have to offer. After a day enjoying spring in beautiful Vermont, we know you’ll sleep well in your quiet, private log cabin at the Ridge. Sweet dreams!